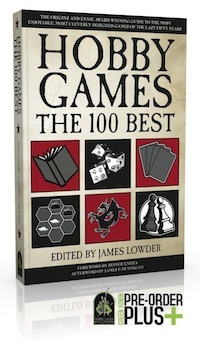 We’ve sent our Origins and ENnie Award winning book Hobby Games: The 100 Best back to press! Since it hasn’t been available in printed form for so long, we’re treating it like a brand new book, and have opened up pre-orders. From now until it gets back from the printers, when you pre-order HG100 from our Green Ronin Online Store, we’ll offer you the PDF, mobi, or epub version for just $5 during checkout. Or, if you have a local game or book store that participates in our Green Ronin Pre-Order Plus Program, you can pre-order the book there, and they’ll give you a coupon code for our online store, good for one of the electronic versions of the book for just $5.